In a written response to the Parliament, Minister of State (MoS) for External Affairs V K Singh has declared that just like every other Indian citizen, Hurriyat leaders are not barred from meeting representatives of other nations. The statement was accompanied with a clarification that no third-party could interfere in the India-Pakistan bilateral talks. This response comes after the recent meeting between Pakistan Foreign Secretary Aizaz Ahmed Chaudhary and his counterpart S Jaishankar on the sidelines of the 'Heart of Asia' conference. "Since the entire state of Jammu and Kashmir is an integral part of the Union of India and these so-called Kashmiri 'leaders' are Indian citizens, there is no bar on their meetings with representatives of any country in India," Singh conveyed to the Parliament. 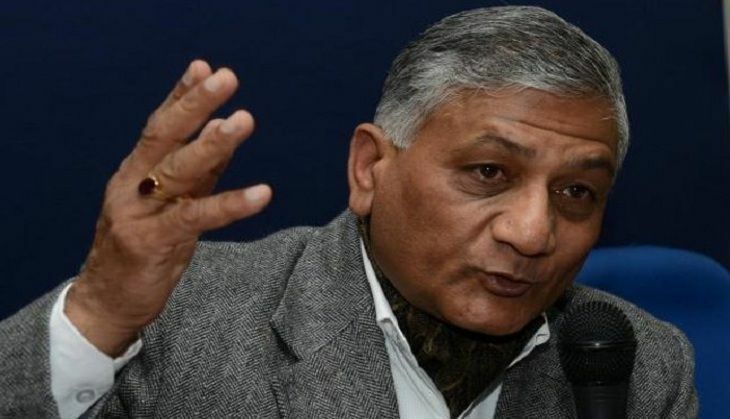 This statement from V K Singh came in response to a query raised about the meeting between leaders of the All Parties Hurriyat Conference (APHC), and Abdul Basit during the Pakistan Day celebrations. "India has consistently maintained that there is no role for a third party in the bilateral dialogue between India and Pakistan as per the Simla Agreement and the Lahore Declaration. India's displeasure at Pakistan's attempts to interfere in India's internal affairs has been repeatedly conveyed to Pakistan," he added.